Judges application MUST be filled out online – no email or phone entries will be accepted. You may judge more than one contest. Only one form needs to be completed. You will be asked on the form which contest(s) you are applying to participate in. Select all that you are interested in judging.  Judges who have applied for the 2019 World Series of Barbecue will be notified no later than end of July if they have a confirmed seat and/or are on the waiting list. Judges are encouraged to sign up to judge more than one event (with the exception of Open Sides and Kids Que due to timing). Filling out an application does not guarantee you a spot judging or as a table captain. Check back for additional information about judging and registration after April 15, 2019. Questions? Email the BBQ Team at [email protected]. Invitational Judging will occur on Saturday, September 14, 2019. Invitational judges from the year prior (2018) are given first right of refusal to sign up to judge. If additional judging spaces become available, Open judges that have signed up will be selected at random* and asked to judge the Invitational. Invitational judges from 2018 will receive an email with an invitation to apply in April. If you believe you should be receiving an invite and have not received the email by the end of April, please contact [email protected] with your name and a copy of your signed KCBS invitational judging papers from 2018. All Invitational judges must be a Certified Barbecue Judge in good standing at the time of the event. Each judge and table captain will be verified with KCBS to confirm good standing. If you are not a current CBJ or not in good standing, please take the CBJ courses offered by the American Royal in May or in September at the event. All barbecue judging is complementary, but a small donation of $15 is appreciated and goes back to support the American Royal mission. *Random judges selected are only those who are current Certified Barbecue Judges. Open sides judging will occur on Saturday, September 14, 2019. Judges are selected on a first come – first serve basis. Judging is complimentary, but a small donation of $15 is appreciated and goes back to support the American Royal mission. Judges may not judge Open Sides and Kids Que due to timing. If a judge signs up for both, they will be placed at one of the events based on the American Royal’s discretion. Signing up for both a table captain and a judge is not recommended. Those who sign up as both will be placed as either a table captain or judge at the discretion of the American Royal based on need. Signing up for both table captain and judge does not increase your chances of being selected or guarantee a seat. Judging Application will open at 12:00 pm on April 15, 2019. Open Meats judging will occur on Sunday, September 15, 2019. Kids Que Judging will occur on Saturday, September 14, 2019. Judges will be tasting both divisions of the competition (hamburger and steak). Judges may not judge Open Sides and Kids Que due to timing. If a judge signs up for both, they will be placed at one of the events based on the American Royal's discretion. Do you have what it takes to judge the biggest and best party in Kansas City! Each year, teams compete for the high honor of being named the Individual or Corporate Party of the Year. Party of the Year Judging takes place on Friday, September 13, 2019. As a judge, you will have the opportunity to inspect these events and rate them on showmanship and overall site appearance. LIMITED SPOTS ARE AVAILABLE FOR JUDGING - TICKETS WILL BE AVAILABLE IN EARLY SUMMER. CHECK BACK FOR ADDITIONAL INFORMATION AND DETAILS. 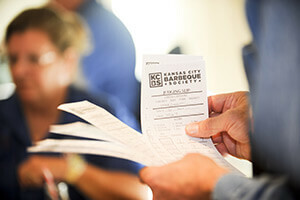 All American Royal invitational judges must be certified KCBS judges. These classes will provide you the opportunity to learn about how to judge competition barbecue and further your education in barbecue. Barbecue teams: want to learn exactly how your competition protein is judged and help your overall score? Come take the CBJ class on Thursday before the competition begins on Saturday!